Our range of products include single acting plain ram jacks, threaded ram hydraulic jack, double acting hydraulic jacks, double acting hollow ram jacks, flat jacks and hydraulic jack. We are involved in offering of a superior quality assortment of Single Acting Plain Ram Jacks with the assurance of quality. Known for their optimum performance and corrosion resistance, these jacks are manufactured using premium quality raw materials. Our offered jack is suitable for various lifting applications at workshops, power plants and industrial maintenance. Further, clients can avail these jacks from us at the market leading prices. 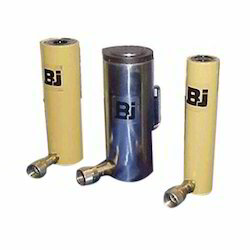 With an aim to establish ourselves among the leading organizations, we are benevolently offering an exclusive range of Threaded Ram Hydraulic Jack. 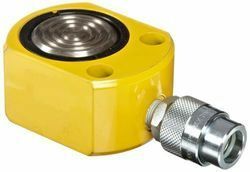 These hydraulic jacks are manufactured by using high quality materials, heat-treated and processed by imported CNC lathes. 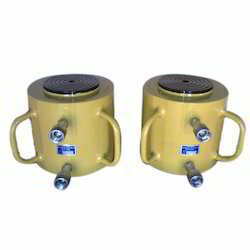 The clients can avail our hydraulic jacks in different customized sizes, models and specifications as per their requirements. We offer our hydraulic jacks to customers at pocket friendly prices and deliver within the promised time frame. We have marked a distinguished position in the domain by offering a broad array of Double Acting Hydraulic Jacks. These jacks are used for lifting heavy load and applying great forces. Manufactured by making use of quality checked components in conformity with set industry standards, offered jacks are duly tested on carious quality parameters by our adroit technical experts. 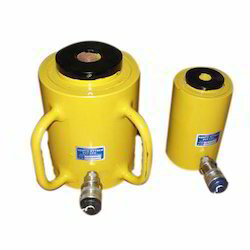 In addition, these hydraulic jacks are available with us in different specifications at reasonable prices. Base Mounting Holes, Collar Threads are provided for easy fixturing. Hard Chrome Plated Rams for Corrosion Resistance. These Flat Jacks Single Acting, Spring Return are ideal for areas where closed height is a constraint and are suited for pushing,raising,separating and lowering of viaduct structures - bridges and crane repairs,site maintenance, aligning and lowering of heavy machinery, lifting of motors. Supplied with Quick Change Couplers and Dust Cap. 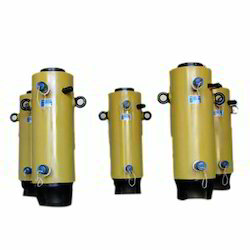 These Hydraulic Jack can be used in a wide variety of situations such as routine maintenance, production, industrial body building, frame works, shipyards heavy civil constructions such as bridges these can also be used in hydraulic presses and other special purpose. Heavy duty, Pre-Tensioned Springs for fast retraction. Leveraging upon our technologically-advanced production facility we offer this Single Acting Hollow Ram Jacks. This jack is manufactured under the guidance of skilled professionals in adherence with industry defined quality standards using supreme quality components and ultra-modern technology. Provided jack is used to lift the tractor trolley to a certain height efficiently. Offered jack is tested on all levels of production to ensure its quality. 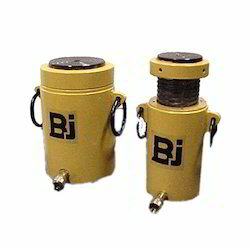 Looking for Industrial Hydraulic Jacks ?